Summary: Following an accident in his seventh year, Draco loses his eyesight. At first he completely withdraws, avoiding any hint of pity, as well as any assistance; he is determined to succeed on his own. But after Harry elbows his way into Draco's dark world, both boys find themselves in a strange new friendship, and they each learn new ways to see each other … and themselves. Disclaimers: This story is based on characters and situations created and owned by JK Rowling, various publishers including but not limited to Bloomsbury Books, Scholastic Books and Raincoast Books, and Warner Bros., Inc. No money is being made and no copyright or trademark infringement is intended. The spell Tempus is borrowed from Aidan Lynch's Unthinkable Thoughts. Draco's Leader was inspired, in part, by the Bubble device in Lori's PoU universe. Both are used with permission. "...then, in 1752, the giant Melvin the Morose accidentally stepped on some goblins; this interrupted the ongoing goblin rebellion but started the goblin-giant war, which lasted for seventeen years and twelve days. During that time..."
Draco resisted the urge to slam the book shut, just to silence the incessant and irritating drone. History of Magic was boring enough already; did the charm which caused his textbooks to read aloud have to be monotonous too? It actually almost sounded like Professor Binns; even his Potions books got boring after a while. He rubbed his eyes tiredly, a habit which seemed to have stayed with him as a gesture of fatigue, even though his eyes were no longer doing the work. The book droned on, and he forced himself to pay attention; there was a History test next week on material they were supposed to have revised over the holidays, and he wanted to get his studying over with as soon as possible. That meant getting as much information into his brain the first time around, minimising the number of times he had to listen to the blasted passages. It had been two months, two dark months, since the accident at the Quidditch match. In his victory, he'd foolishly forgotten how close he was flying to the goal hoops; the lapse had cost him his vision. Wizarding medicine could cure many things, but it could not, doctors informed him regretfully, reverse brain damage. The injury had been to the occipital lobe at the back of his head, so they said, and there was nothing anyone could do. Though his father had threatened, and his mother had pleaded, and he himself had disbelievingly demanded second, third, twelfth opinions, the answer was always the same from the medical community: blindness. Permanent. Harry searched the shelves at the back of the library until he found the book he was after, a review of specialised fungi he needed for his Herbology class. He dusted it off, gave it a cursory glance-through, then tucked it under his arm. There were several more books he'd need later, but he decided he'd get them tomorrow. He wasn't like Hermione, who could plow through a stack of ancient, dry textbooks in a single night. This one tonight would be plenty, in addition to his normal work. Speaking of... there was that History of Magic test next week; he needed to get started before Hermione began chasing after him with her colour-coded notes. It was as he was winding his way through the shelves along the back wall that he became aware of a low, monotonous voice. It sounded remarkably like Professor Binns, only less interesting. Curious, he poked his nose into one of the small side rooms tucked into the wall. Then stopped short. In the candle-lit room sat Draco Malfoy, head propped up on his fist. A textbook lay open on the table before him ... and it was this book which seemed to be talking. Either that, or someone else had an Invisibility Cloak, because Draco certainly wasn't uttering so much as a murmur, and no one else was apparent. "Whoever you are, you should either speak up or get out. I don't appreciate being stared at." "Er..." said Harry, startled. He watched as Draco turned his head - not to look, but to listen; his head swiveled only far enough so that his left ear was pointed directly at the doorway where Harry stood. "It's me, Harry. Potter. I ... uh ... didn't mean to interrupt. How did you know I was here, anyway?" "Your footsteps, idiot, what else? School shoes have never been terribly silent on stone floors." "Oh." Harry felt foolish; he hadn't thought about that. "So ... um ... is that your book talking? So you don't have to read? I wondered how you were managing that." Draco sighed irritably. "Yes, that's how it works now. I charm the book and it reads aloud to me. Just like a child getting a bedtime story, only much less interesting. I come here to study so the book's voice doesn't bother anyone - I don't need people staring at me because of the noise." Harry stepped into the little room so he could hear the book more clearly. "Wow, it sounds dull. Do the books all talk the same?" "No." The Slytherin's voice was curt. "Now, if you've finished playing twenty questions, I'd like to get this over with." "You know," Harry offered, coming to stand in front of the other boy. "I could read it to you instead." The blond moved his head to follow Harry's voice and Harry found himself slightly unnerved by his first close-up look at Draco's face since the accident; the same, pale, pointed face, yet oddly blank. He was used to the grey eyes shooting daggers at him; now they were a stone wall - flat and impenetrable, focused on nothing. "What on earth for?" the blond snapped. Harry was oddly reassured by the fact that Malfoy's voice, at least, could still shoot daggers. "Well ... I just thought that it'd be less boring, if I-"
Malfoy snorted. "I don't need your pity." "I'm just trying to help, okay? What's so wrong with that? You're bored, and I'm offering to try to make it less boring." "Ah yes. How could I forget?" the blind boy drawled. "Harry Potter, everybody's hero. No problem too trivial for our wonderboy." "What is your bloody problem, Malfoy?" Harry was getting angry - whether more at himself or at the Slytherin, he wasn't sure; what on earth had possessed him to offer to help this git? "My problem? My problem is that you're butting in where you're not needed and are, in fact, interrupting my work. Now, if you'll excuse me, I have some studying to do. Go save some damsel in distress if you're that eager to help." And with that, Draco turned back to his book, flipped back the page it had turned while they were arguing, and let it resume reading. The next day, however, he was back. He told himself it was to retrieve the additional books he needed for his essay and, in fact, this was the case. He ignored the fact that he didn't strictly need to be skulking around in this back corner in his stocking feet, shoes in hand, in order to achieve this. Harry wasn't entirely sure himself why he was here, but after yesterday's exchange he was curious to watch Draco and see how he managed. He hadn't seen his former nemesis much since the accident - first he'd been gone, and then he'd largely kept to himself. No longer did he taunt Harry and his friends, or, indeed, talk to anyone at all, unless spoken to directly by one of the teachers. But he somehow seemed to be compensating - he had returned to school completely caught up on missed work, he was prepared for every class, and Harry rarely saw him ask for help with ... anything. But how did he do it? He slipped up to the little study room, determined not to be caught this time, but when he got there, he found he needn't have bothered with stealth. Instead of resting on his fist, Malfoy's head was, this time, resting on the table. His eyes were closed, and he seemed completely oblivious to the droning of the History book open before him. Apparently the boredom had proved too much today, and that gave Harry an idea. He snuck into the room, pointed his wand at the book and whispered "Finite incantatum" . The voice stopped. He then carefully pulled out a chair and, setting his bag on the floor as quietly as he could manage, sat down and waited for the other boy to wake up. It didn't take long; apparently he was a believer in brief naps. The blond sat up with a groan, sleepily rubbed his eyes and, as he became aware of the room's silence, felt around for the now-quiet book. "Stupid charm," Draco grumbled. Harry cut in before the other boy could re-activate the spell. "The Incredible Voice prove too much of a thrill today?" Malfoy jumped, his head whipping over in Harry's direction. "Potter, what the hell are you doing here? You damn near gave me a heart attack." 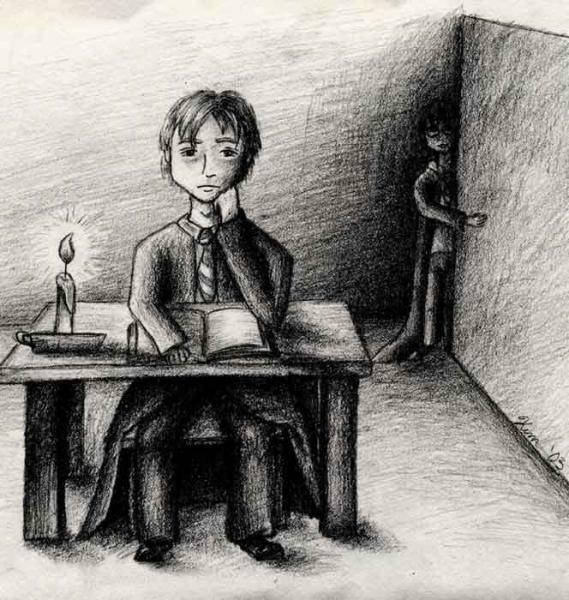 Harry shrugged, forgetting that the other boy couldn't see him. "I was in the neighbourhood, saw you snoozing, and came to repeat my offer." "Are we on that again? I told you, I don't-"
"Yeah, yeah, I know. You don't need pity. But neither do you need to be lulled to sleep by your own textbooks. Look, I have to study for the stupid test too. So, as long as I'm going over the material anyway, I might as well go over it with you." "Why not go over it with your little Gryffindor friends?" Draco snapped. "Because Hermione has to lead a prefects' meeting tonight, and Ron is off with his girlfriend Mandy. Look, we're wasting time here. I have to study, you have to study, and this stuff is already bloody boring. At the very least, we can keep each other awake." Harry couldn't resist adding a jibe. "Looks like you could have used that awhile ago." Draco scowled. "Fine," he conceded. He shoved the book in Harry's direction. "You're obviously never going to leave me alone otherwise. If you're that determined to read yourself hoarse, have at it. But do try to be entertaining." Harry smiled wryly as he picked up the text. "I doubt even the Weasley twins could make giant-goblin wars truly entertaining, but I'll try." He flipped back a few pages, and began to read. "'After the Snodgrass Treaty was signed in 1769, Olfred the Obtuse set up a community near the insignificant town of Herringsford....'"
Draco started each morning lying in his bed, breathing quietly and deliberately, trying to determine if he was actually awake or not. Opening his eyes had no effect on his brain, so he would take a few minutes to acknowledge he was conscious of his body and aware of his surroundings and, therefore, not dreaming. On this morning, the chill in the air brought him to realisation quickly, and he reached out automatically for his wand, which he left in the same spot on his nightstand each night. In a practiced gesture, he pointed it at the clock, which stood at an equally precise spot next to it. "Tempus," he murmured. "Six twenty three," the clock told him. With a groan, he sat up, hoisted his legs over the edge of the bed, and planted his feet on the cold stone floor. That always woke him up, really quick. Carefully moving around to the foot of his bed, he found his trunk, knelt down, felt around for his bathroom kit, and then, trailing his fingers along the wall, headed out and down the hall to the showers. He liked to go early, before there was much competition for the hot water. Or others to stare at him. Once the mediwizards had determined he was going to get neither better nor worse, and had treated any lingering physical pains, he had been sent home with a tutor to learn compensatory skills. How to get around. How to better use his remaining senses. How to charm printed material so it would read aloud to him; a similar charm was used on special tags sewn into his clothing so they would describe themselves. How to cut potion ingredients without losing his fingers, point his wand with relative accuracy, and a host of other skills needed for him to finish his schooling and survive in the real world. He resisted anything which required another person's assistance, as much as possible. A Malfoy did not ask for help; a Malfoy did not rely on anyone who might fail him. He had been discouraged from showing weakness his whole life; he certainly wasn't going to start now. Especially as his father had almost immediately lost interest in him. He was no longer destined for the Dark Lord or any other positions of power, as Lucius now considered him flawed and weak. He had, apparently, no more use for his son. When the elder Malfoy was around, he was as polite as any of the medical staff had been, but that was about it. Draco was determined to prove he was still capable as a wizard - as a person -- just so he could mentally stick his tongue out at the man who had rejected him. The loss of future career goals bothered him less; he had never really been given a choice in the matter, and now that he had one, he couldn't think that far. His mind was too focused on getting back on his feet and away from everyone. As soon as he could manage it, he shook off the clutching arms of his mother and Enid, the human servant who had been hired to tend to him (House Elves being too short to guide him around). For short distances -- around his room and down the hall to the toilet -- he was able to navigate on his own with measured steps, sometimes with one hand against the wall. For longer trips he was given a Leader; it was expensive, but as soon as his skills tutor had mentioned the device's existence, he had demanded one. "What am I going to do, find someone to lead me about everywhere I go at Hogwarts, like a little child who hasn't learned to cross the street?" he complained at dinner one night. "Yes, but Draco, darling, a human is so much more reliable ," his mother replied, uncertainly. "What if that ... Leader thing ... misses something?" He turned toward her voice. "Do you know how many times Enid has forgotten to mention a slight step up where the stones are uneven or, worse, something low-hanging? My housemates will be just the same; leave it up to Crabbe and Goyle and you might as well break my neck now and be done with it. What do you think the cost of the Leader is for ? My tutor says it's the best." His tutor proved to be correct. With some practice, mostly to gain confidence and trust in the device, he was soon able to travel most anywhere he wanted on his own, either by giving it directions, or, in familiar situations, simply stating his destination. The Leader, a small sphere about the size of an orange, hovered just in front of him at head-height, and was charmed to sense obstacles, stairs, overhangs and anything else which might interfere with his ability to move about safely. It told him when to turn, stoop, watch his feet, when the top or bottom of the stairs was reached, or when he needed to pause outright for oncoming or intersecting traffic, or for any hazards. He need only tap it with his wand and murmur the appropriate charm to activate it each time he wanted to go somewhere, and then clearly state his next directions, as needed. Although he couldn't see it, he knew the Leader glowed slightly when they were on the move, as a means of alerting other travelers around them; this nearly eliminated the need for Draco to stop for or sidestep anyone, as people, even those who had no idea what the device did, naturally veered around it. He didn't like advertising his movements like that, but, with the alternative being dependence on others to less reliably lead him about, he grudgingly accepted it. The test came in January, when the Christmas holidays ended and he returned to Hogwarts for the first time since the accident. As his injury had happened in mid-November, the rest of the autumn term had been spent first in the hospital, and then at home learning how to survive his new dark world. Draco had insisted on keeping up with his work; the situation was already bad enough in his mind - he refused to compound it by falling behind academically and risking repeating the year. Additional tutors, therefore, brought him his assignments each week as soon as his compensatory learning skills were strong enough. Professor Snape himself had made a few calls; he'd made Draco brew the more important potions, then had departed to socialise with the elder Malfoy over dinner. Draco ate in his room as often as he could get away with it. Therefore, when he first stepped off the train after the Christmas holidays, he was essentially up to date in most of his subjects, and theoretically armed to compensate for most issues; however, facing the reality of this new life at Hogwarts was quite different. Damp, but no longer dripping, a bathrobe-clad Draco returned to his dormitory and went to his wardrobe. He pulled the right-hand door open and reached for the uniform shirts which hung on that side. 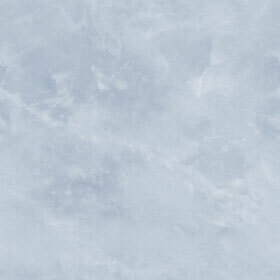 "White. Solid," the tag told him, after he'd murmured the appropriate charm. Although there really wasn't much doubt he'd grabbed the right shirt - he was well acquainted with how his clothes were organised, as well as how they felt in his hand - the Slytherin in him wouldn't have put it past his housemates to slip in and swap things around, just as a practical joke. He pulled out his trousers, a tie, his "Grey. Green trim" jumper, his Hogwarts robe and his underwear, then quickly got dressed. "Your hair needs combing," his reflection chastised; there was a mirror on the inside of the wardrobe door. "Yeah, yeah," he grumbled, feeling around for his belt loops. "Give me a minute." It took him only a few moments to finish threading the belt through, and then to neaten his damp hair; muscle memory came in handy. "Much better," came the reflection's response. Draco smoothed his hands down his robe reflexively, checking his appearance by feel one more time. The mirror didn't seem too inclined to lead him astray, but he still didn't wholly trust the opinionated glass. Still, it was all he had, given the alternative - asking his housemates each and every morning if he looked all right, like a needy child or, worse, a vain girl. No thanks. "Accio Leader." He held out his hand, and felt the smooth globe fall gently onto his palm. "Tendo," he told it. There was a slight whirr as the device activated, and he felt the slight breeze as it rose to hover in its customary position by his head. "Great Hall." Out the door he went. ("Turn left.") He almost didn't need the thing to find his way to the most frequently visited rooms. He was getting good at keeping a mental record of how many steps, how many stairs, and when the next turn would be. But he still depended on it to warn him about vanishing steps, obstacles left on the floor by Peeves, and other hazards. Today's journey up to breakfast, however, was uneventful. The Leader directed him to the end of the Slytherin table he regularly sat at now, and he took his customary seat without fanfare. "You've got scrambled eggs in front of your left hand, toast above your plate, and muesli just to the right of that," Blaise told him. "Oh, and the teapot's here--" Draco heard a thunk as the teapot was set down to his right. "-by your right elbow." This was one area where Draco had been forced to ask for help; without a person to tell him, he had no idea what exactly was being served, or where it was on the table. House Elves did much by habit, but even they did not place the dishes in precisely the same place each day or serve the same food and, anyway, items were sometimes moved around by other students before he got there. Blaise and Pansy were his most reliable informants in this area; after two mornings of "The milk is over there" from Crabbe and Goyle, he'd stopped asking them. "Thanks," he muttered, still hating that he had to ask for assistance with anything. He got himself some food and ate in silence. He could hear his housemates stumble up to the table, yawning and gabbling before their first lessons, but he did not join in. Where he had once been the acknowledged leader of the House, he knew that he now was seen as nothing more than a fallen king; for a House that was all about power, what could a blind student do for them? Nor did he want their pity and scorn because he couldn't fly, because he'd lost his golden spot on the team. His former so-called friendships had never really been that close, he told himself -- more socialisation by default, or as part of the never-ending power play. And he didn't even think about romantic relationships. As with his career, he had grown up never thinking he'd have much say in his future; Malfoys usually were married for reasons of politics, not love. The fact that Draco was gay would not have deterred Lucius in the slightest; there were always lovers to keep on the side, after all. But although his blindness had bought him his freedom, it was a moot point; he could not imagine anyone wanting him now. It was far easier to pull away from everyone before he could be rejected. He kept to himself, lived as normally as possible, and did his work on his own. Well, until the previous day, anyway. Draco told himself he had only done it to get the Gryffindor to shut up, but he had to admit, it had been surprisingly nice to study with Harry; he had a good reading voice. And even the initial fight had felt good - they hadn't bickered like that since ... Before. It was perhaps the most normally anyone had treated him so far, even if the subject did have to do with him. Their subsequent disagreements, however, had been far more ordinary, as they argued over the reading material and the relative importance of certain eras over others in their preparation for Binns' test. Breakfast finished, he pushed his seat back. "Tendo - Potions," he told his Leader, automatically turning to the right, where the doors were. At least today he would start with a subject he enjoyed, even though it - like everything else -- was much more difficult for him now.